Live the experience of premier services in the elegant rooms, the luxurious waterfront suites or the exclusive villas of the Resort, enjoying the amazing views and the numerous individual swimming pools. 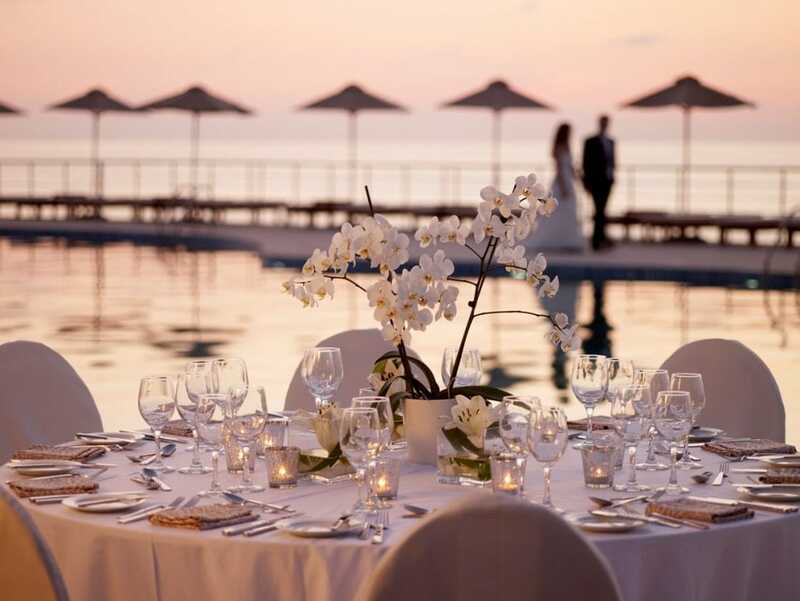 The Royal Blue resort is the ideal choice not only for your holidays or honeymoon, but also for your wedding, events, business meetings or conferences. Enjoy the luxurioys hospitality, live a gastronomy experience of authentic Mediterranean cuisine made with the most natural local ingredients at the resort’s restaurants and spoil yourself in the refreshing Pure Senses Spa. The Rοyal Blue, the luxury beach resort in Panormo, Rethymno, Crete awaits to welcome you in a unique experience of exclusive hospitality, relaxation and recreation. 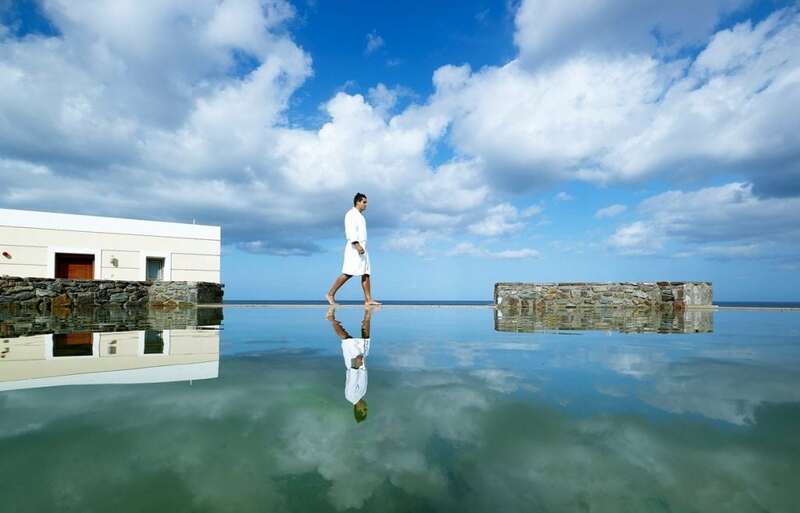 Embark on an unforgettable journey in Crete, right from the hotel’s fascinating rooms, suites and villas, majestic pools, delicious tastes and refreshing wellness and spa and spa facilities. 22 km from Rethymno, 55 km from Heraklion, near the village of Panormo. Evening entertainment: Rethymno (22 km). Pebble beach, entrance to the sea: sand and pebble. Sun beds, umbrellas and beach towels are provided free of charge. Symposium: Symposium presents the best of International cuisine, inviting you to an electric mix of live cooking station, a true assault on all your senses, making your dining experience an exciting journey from entrée through to dessert. Background music and occasionally live music. Cave Restaurand: Cave is the brand new a la carte Restaurant of the Royal Blue with an utterly exclusive character. 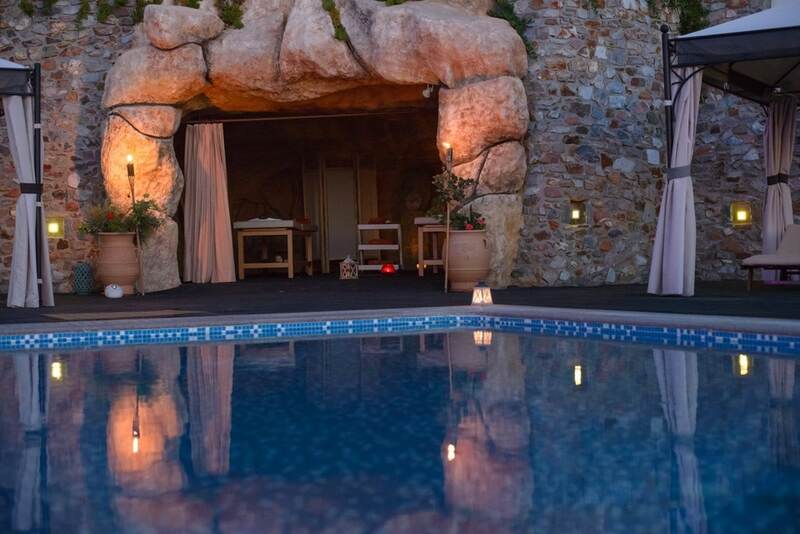 Live a truly exclusive dining experience in Cave mystical Restaurant, at a space combining amazing views to the deep blue sea with a carefully selected collection of art pieces and a stylish & elegant decoration and ambiance. The flavors and aromas of the various ingredients create a unique blend of tastes and scents which can be perfectly combined with a bottle of a wine, selected among a rich local & international label collection. Eora: Embark on a fantastic voyage through the flavors and aromas of the countries of the magical Mediterranean Sea. Mediterranean cuisine, simple but so rich, containing all the flavors of the sea and nature. Located at the edge of the resort facing the blue crystal waters of the main swimming pool and the endless blue of the Cretan Horizon and with a menu that exceeds the definition of ‘delicious’, Eora delivers the best of nature in your dish, transforming your every meal, lunch or dinner, to an unforgettable experience. Elia: Elia Restaurant is a tribute to the most famous for its nutritional value Mediterranean cuisine. Carefully selected local products, cooked and served with imagination and love will offer you quite a strong Cretan culinary experience. 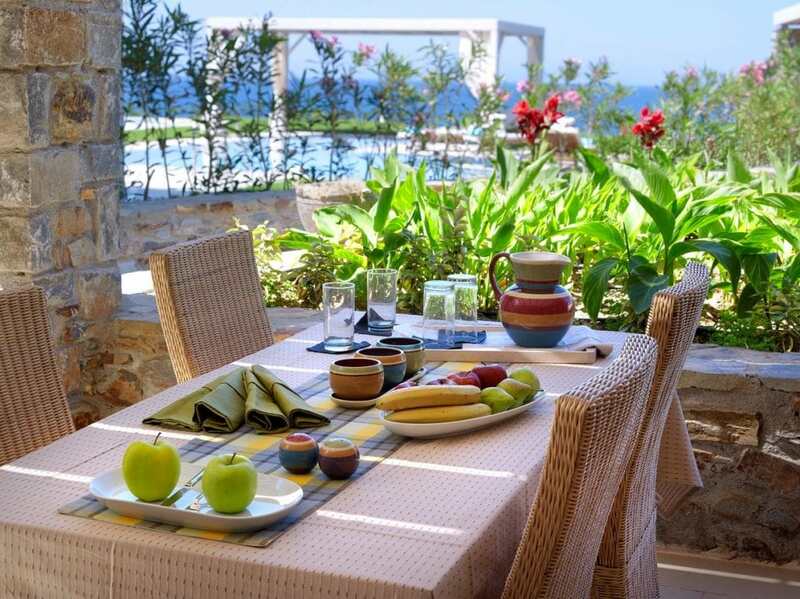 The restaurant is set at an amazing spot within Royal Blue Resort, overlooking the deep blue Cretan Sea, the bright Greek Sun and the nearby infinity lagoon - a complete Greek experience! Inviting and fragrant, light hearted and colorful, based on vegetables, local ingredients and the amazing olive oil, the restaurant presents simple dishes that require little cooking time and a style of cooking that prefers vegetable fats - the main reason why nutritionists all over the world recommend it. Sunset Lounge Bar: enjoy our 10 modern and 10 classic cocktails that will intrigue even the most demanding palates. 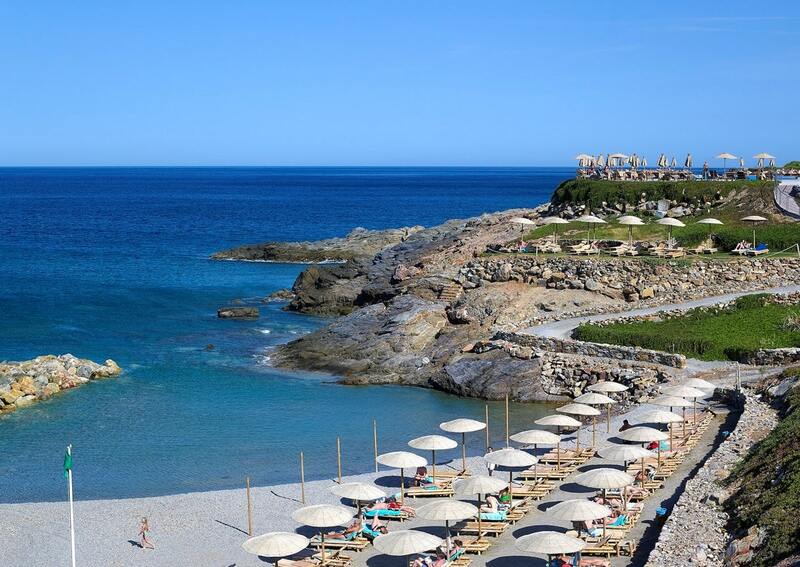 We recommend for a relaxing holiday couples and families, including children. Our stylishly decorated in warm and soothing tones superior rooms (approx. 30 sq.m.) offer luxurious settings and elegant amenities to ensure an experience of absolute comfort. Gloriously situated overlooking the sea from the side of the balcony, all rooms dispose king or twin size beds and simple designer interiors, that will offer you the utmost relaxation and serenity that is dominant throughout the resort. Indulge yourself in the luxury, that only a five star hotel can offer. Our luxurious and comfortable Garden View Superior Rooms (approx. 30 sqm) offer a relaxing and elegant stay. The warm colors of nature used in the decoration of the rooms - brown, beige and cream, are complemented by the vivid colors of the resort’s gardens and yards. Available with twin or king sized beds, high quality amenities and spacious bathrooms, the Superior Garden View Rooms of the hotel will carry you away in an experience of tranquility and luxury that you so much look for during your holidays. Our elegantly designed Superior Rooms of approx. 35 sqm, with twin or king size beds, offer luxurious comforts and elegant, high quality amenities that create a sensation of absolute serenity and relaxation. Their private terrace offers impressive sea views or refreshing rose garden views and is open to a spacious terrace with a sharing pool. The sunbeds and umbrellas for all neighboring rooms where guests can enjoy the sun, offer a more private and secluded swimming and sun bathing experience. The sense of tranquility is completed with a glass of excellent local wine in the relaxing bathtub of your room bathroom. Our waterfront, sun-filled Superior Suites, with an approx. size of 55 sqm, are located on the 1st floor of a two story building. The spacious living room, the private balcony with breathtaking panoramic sea views, the outdoor Jacuzzi and the comfortable bedroom with a king size bed offer you the absolute experience of a luxury and exclusive stay during your holidays. 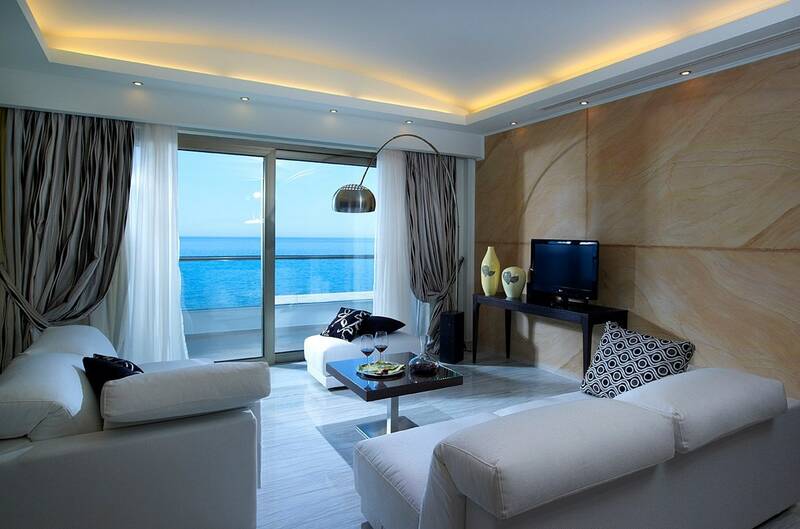 With a contemporary design, modern furniture and elegant high quality amenities, our Superior Suites are designed to offer guests the most upscale comforts of a luxury holiday beach resort. Lounge on your bamboo parlor on the balcony, enjoy a Jacuzzi 'session' overlooking the endless horizon of the sea and sky or just snuggle up indoors. Unwind, forget time and relax. Leave all details to us and let us make your stay an unparalleled sensorial journey. Located at the waterfront of the hotel with a panoramic view at the deep blue Cretan Sea, our comfortable and luxurious Deluxe Guest Rooms approx. 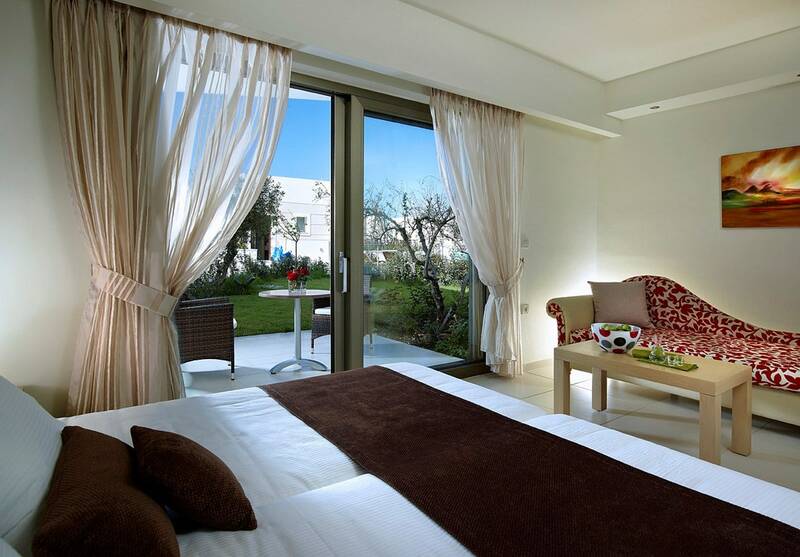 30 sqm indoor space offer the best setting for your unforgettable vacations in Rethymno, Crete. Live the unique experience of a room with an Individual Pool, terrace and garden and spoil yourself with all the luxury and comfort that you deserve. Enjoy the sun, dive in your Individual Pool or make your terrace the ideal setting for the most unique and private dining experience! Furnished in minimal style, our Deluxe Rooms (double, triple or twin) have a king size bed. The high quality amenities complete the utterly luxurious and exclusive experience of staying in one of our Deluxe Guest Rooms with Individual Pool. Honeymoon Suites with Individual Pool have a total size of 103 sqm (55 sqm indoor space and 48 sqm outdoor space) and are located on the ground floor of a two story building, directly by the waterfront. The modern interior of our comfortable Honeymoon Suites reflects a distinctive architecture with clean lines and simple design, which complements the exterior space and nature. The Suites offer the luxury of a spacious living room, a bedroom with king size bed, high quality amenities and a marble-lined bathroom with a separate shower cabin. The breathtaking panoramic views of the resort can be enjoyed from the private terrace of each Suite with an Individual Pool, sunbeds, lounge chairs and lawn area. Enjoy the sun and the water in your own privacy and arrange a romantic candle light dinner under the stars, just a few meters from the sea! Or just pull back the curtains, lay back on your comfortable couch or bed, let the sunlight fill your room and lose yourself into the endless horizon of blue. 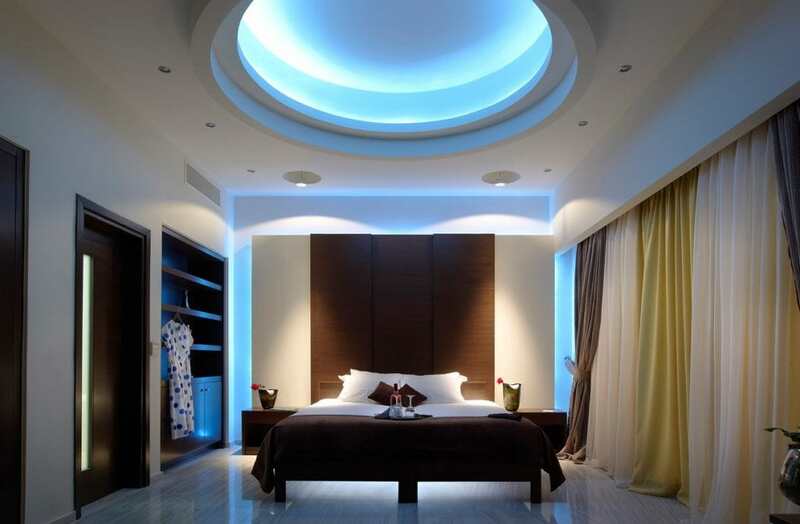 The Two Bedroom Suite 175 sqm approx. (85 sqm indoor space and 90 sqm outdoor space) is located on the ground floor of a two story building, right at the waterfront, offering amazing sea views, as well as the absolute luxury of two Individual Pools, individual terrace and garden. With two bedrooms with king size beds, a spacious living room, two marble bathrooms and high quality amenities, the two-bedroom suite can host up to 6 adults, either on a sofa bed or an extra bed. 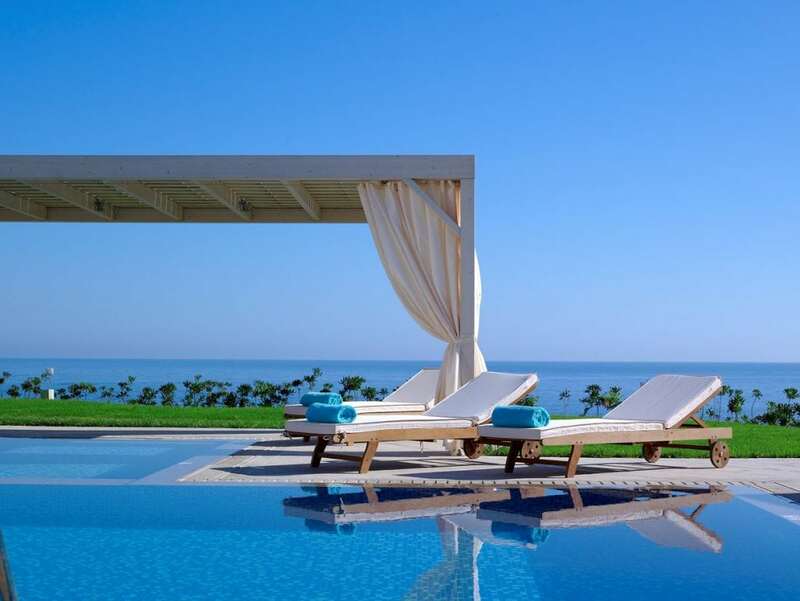 Relax on the sunbeds by the Individual Pools of your suite, enjoy the sun and spoil yourself with the privacy that this amazing Luxury Resort in Rethymno, Crete has to offer you for your dream holidays. The Royal Blue maisonette style Villas with a size of 114 sqm (69 sqm indoor space and 45 sqm outdoor space), are located right by the waterfront and are especially designed for guests seeking luxury, exclusivity and privacy. Each villa consists of an elegantly appointed spacious living room and a bathroom at the ground floor, as well as a comfortable bedroom with a king size bed and bathroom at the first floor. The villas are open to a terrace with an Individual Pool with sunbeds, as well as a lawn area with flowers. Savor romantic dinners under the starry sky, dip into your Individual Pool or just lounge in your bamboo furniture with a cocktail in hand, mesmerized by the stunning views of the breathtaking sunset, with the sun diving into the sea right before your eyes! If you wish to stay indoors, plump up the pillows, pull back the shadings and let the sunlight fill the room, as you lay bewitched by the beauty of the sea and sky! Our luxury villas are the ideal place to unwind and relax in privacy and style during your holidays, a place where nothing has been left to chance, a place that looks and feels just like home! The comfortable 70 sq. 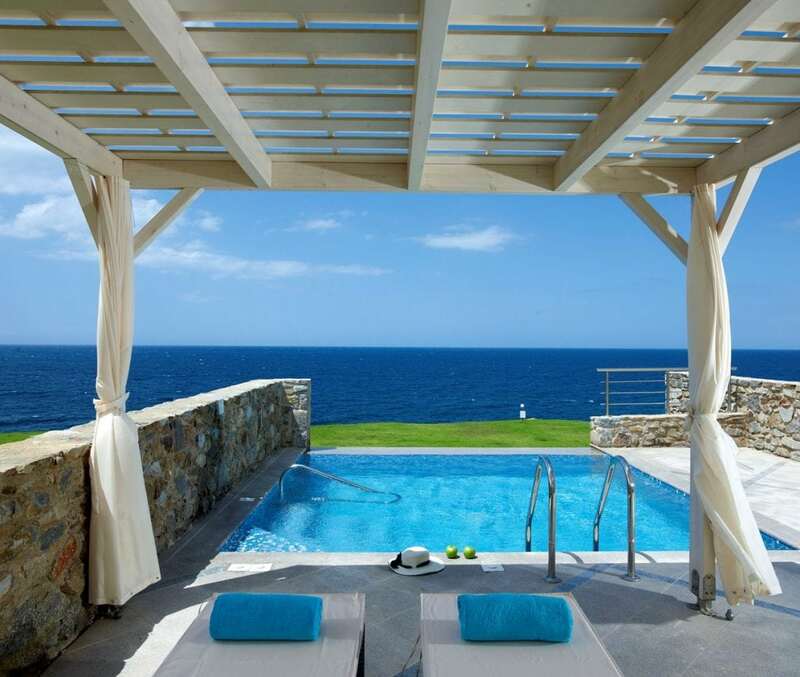 m. waterfront Royal Superior Suite is located on the 1st floor of a two story building, offering amazing panoramic sea views to the deep blue of the Cretan Sea from the private balcony with outdoor Jacuzzi. The spacious living room with the modern design and contemporary furniture, the bedroom with the king size bed, the high quality amenities and the marble bathroom with bathtub and shower will provide you with everything you need for your relaxing and enjoyable holidays in Rethymno, Crete. Relax on your private balcony, enjoy a glass of excellent local wine and allow yourself to embark on a journey of tranquility and serenity. The Royal Superior Suite can host up to 4 people, with the 3rd or 4th adult on a sofa bed or an extra bed. 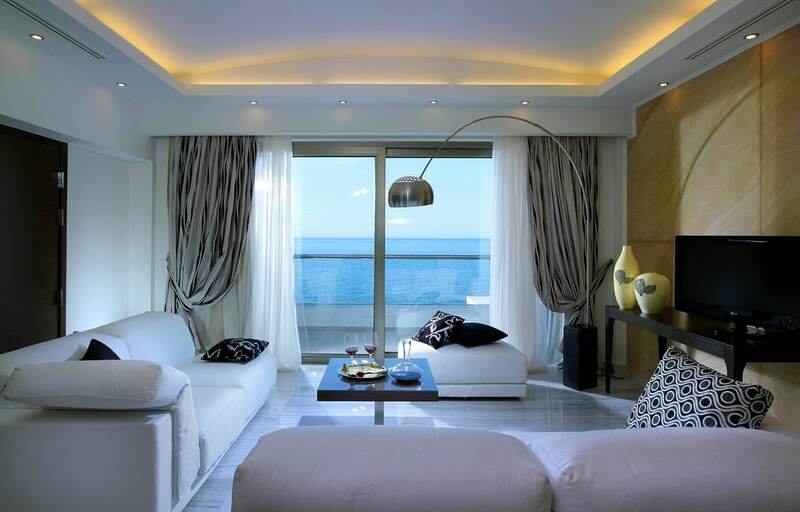 The 135 sqm waterfront maisonette style Presidential Suite offers the luxury of two Individual Pools with sunbeds and umbrellas, an individual terrace and a beautiful garden. The breathtaking sea views are enjoyed while sunbathing on your own private terrace, where a private dinner can also find its ideal setting, right by the sea! The Presidential Suite features a spacious living room, a comfortable bedroom with open marble bathroom and a king size bed, high quality amenities, refreshing and serene colors and contemporary decor highlights. A separate floor of 130 sqm with a private Gym, Sauna and indoor swimming pool, a fully equipped kitchen for private chef with separate entrance for the staff and battler service (upon request), a private entrance, parking space and a BBQ with all the relevant amenities and services offer the unique experience of an exclusive and luxurious stay during your holidays in Rethymno, Crete. The Presidential Suite can host up to 4 people, with the 3rd or 4th adult on a sofa bed or an extra bed. The Royal Villa is exactly what its name implies: a Villa of upgraded aesthetics, high quality services and amenities, décor highlights, sun-filled rooms and stunning views, designed with respect and harmony to the surrounding nature. At approximately 450 sqm (315 sqm indoor space and 135 sqm outdoor space), the Royal Villa is the ultimate selection for luxury, exclusivity, elegance and style. A 3-story building of unrivaled splendor, featuring a spacious living room with welcoming lounges, an office for private meetings, a comfortable master bedroom with open bathroom and Jacuzzi, two spacious bedrooms with panoramic sea views, a separate floor with Gym, Sauna and indoor swimming pool, a fully equipped kitchen for private chef with separate entrance for the staff and battler service (upon request), extensive gardens with flowers, a private entrance, two parking spaces, three swimming pools, a Jacuzzi on the balcony, a BBQ with all relevant amenities and services, a terrace with bamboo furniture, sun beds and umbrellas. Nothing is left out and everything has been appointed and designed with special care to detail. Luxury meets the finest elegance in this premium residence, with features and services that can be offered only by a Luxury Resort such as Royal Blue. Our Royal Villa is designed to become your holiday haven for lavish living with breathtaking views of the sea and sky, where you can forget time, relax and enjoy the most memorable experience of your life.